With snowy trails and snow-covered peaks, you couldn’t ask for a more perfect winter in the Adirondacks. The region is a playground for all kinds of outdoor activities, from snowshoeing to ice fishing and snowmobiling. If you’re planning to visit the ADK this weekend, then here are 8 great events worth checking out! Did you know Saturday is the start of this year’s Take Your Kids to Gore Week? Its true! 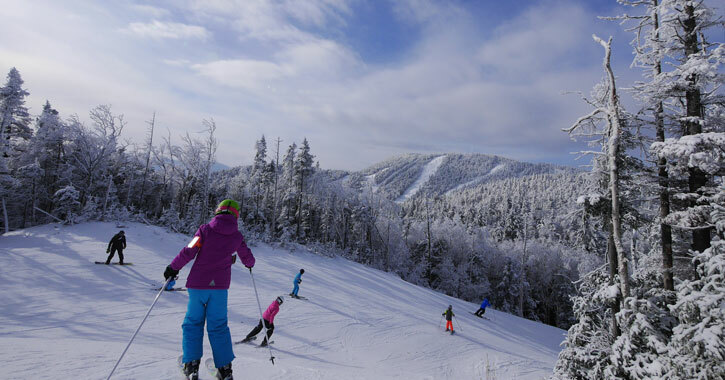 From Saturday through Friday, January 26, all children ages 19 and under can ski or ride for free at Gore Mountain with a full-paying parent. This event includes access to the North Creek Ski Bowl too! Catch all the excitement of the FIS 2018 Freestyle World Cup Aerials at the Olympic Jumping Complex in Lake Placid! The two-day event will feature some of the sport’s best athletes competing in a variety of aerials competitions. Bring the kids to Mt. Pisgah in Saranac Lake on Saturday morning so they can participate in the fun Candy Bar Races. Participating kids will enjoy a race down the mountain and a candy bar at the finish line. Admission is $1. Looking for a relaxing and fun activity you can do with the family this winter? Make your reservation for a sleigh ride at Whiteface Club & Resort in Lake Placid this Saturday. Sleigh rides will be offered from 3:00pm-7:00pm, on the hour. Gather up your ice fishing gear and get ready for the annual Central Adirondack Ice Fishing Derby on Lake Adirondack in the Village of Indian Lake. Check-in will begin at Byron Park on Saturday morning at 5:30am, and the fishing derby will run from 7:00am-3:00pm. Join instructor John Kingsley for an Introduction to Woodturning class at the Adirondack Folk School in Lake Luzerne. This interesting course will teach you the basics of the trade, and it is required before you can move on to the school’s more advanced turning classes. In Tupper Lake, The Wild Center is celebrating local farmers by hosting a Featured Farmer educational program on Saturdays in January. This Saturday, representatives from Tucker Farms will tell their story and explain how they work with local restaurants to provide farm fresh food. The Adirondack Experience’s Cabin Fever Sunday series continues this Sunday with a lecture about several New York State museums and how they have impacted the way knowledge and memory is shaped in the public sphere. The lecture will run from 1:30pm-2:30pm, and it is free and open to the public thanks to the support of the Humanities New York Public Scholars program.